Quasimode are a 4 piece jazz band made up of Yusuke Hirado on piano and keys, Takahiro "Matzz" Matsuoka on percussion, Takashi Okutsu on drums and Kazuhiro Sunaga on bass, combined with the production skills of Masato Komatsu aka Slowly. Formed in Tokyo in 2002, they have gained strong support in their native land. With releases on Freestyle Records, Inpartment, Columbia and now Sonar Kollektiv, they now have a chance to do their thing on the European and global scene. With a mixed club and Latin feel they deliver all their music live, representing a new breed of jazz bands that have gained a strong following from DJs and on the club circuit, while at the same time thrilling live audiences. Their sound is based on the authentic jazz rhythms of the 60s and 70s, and has been linked with similar Jap-jazz outfits like Soil & Pimp Sessions and Sleep Walker. In fact, Sleep Walker's saxophonist, Masato Nakamura, features on "The Man From Nagpur" as well as the down-tempo chill out number "Raw Cotton Field". Other guests on the album include one of the world's greatest jazz vocalists Carmen Lundy on the song "Time Is Love", which originally appeared on the Potter and Tillman album "Space Rapture". Carmen's vocal performance is so powerful it'll blow you away. Tokyo based singer/songwriter Mika Arisaka also features on the song "Dark Beauty" as guest vocalist. There are also many great instrumental numbers on this album, which really give the band a chance to show their individual skills and all round musicianship. The classic swing of "Self Defense" proves just how timeless jazz is. Elsewhere, Quasimode's music is cram packed full of summery Latino rhythms, such as no "Over the Horizon", where Matzz' congos are on fire. Meanwhile, "Last Nine Days" is a romantic ballad, ideal for dancing in the moonlight. The inclusion of three Japanese artists on this compilation (aside from the aforementioned Sleep Walker, the album also features pianist Hajime Yoshizama) shows what a strong jazz scene there is in Japan at the moment. All of these bands (and more upcoming acts from the Tokyo jazz scene such as Native and the Soil & Pimp Sessions) can be heard at The Room club in Tokyo, run by DJ Shuya Okino of the Kyoto Jazz Massive. This is one of the hot-spots where Quasimode can regularly be seen rocking crowds. 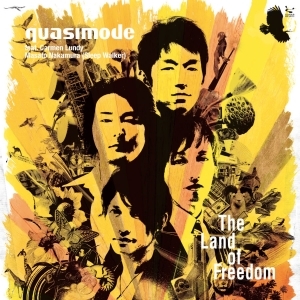 The Land Of Freedom captures on disc the live energy that Quasimode exude when they play in clubs, often to audiences of 2-3 thousand capacity. With such an exploding jazz scene growing in Japan it was clear that Tokyo wasn't big enough to hold all the talent coming from there. One can only hope this rocking band make it to a club near you soon.